Settings page by individual box. 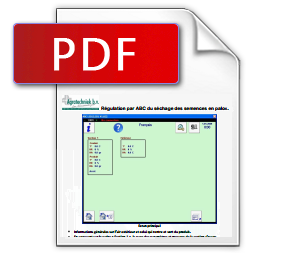 Open this page by pushing on desired box (1.1 to 4.4) in the general overview. 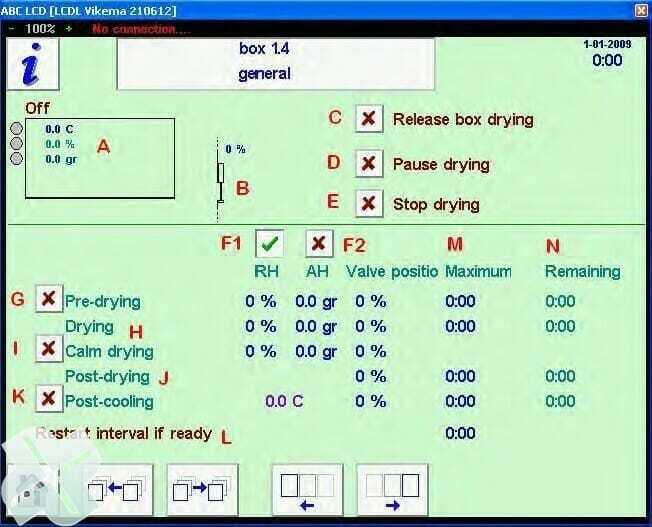 A. Drying box with status and measurement values; T°, RH and AH of the air from the boxes. C. Release for start drying of relevant box. D. Pause for control; drying continues after restart in reached phase. E. The drying process of this box will be terminated. F. Option drying process based on RH (F1) or AH (F2) of the air from the box. Only the value in the chosen column is active.G. Pre-drying phase active; option for phase with higher T° and more process air. H. Drying phase active; Default phase for the drying process. J. Post-drying phase; this phase will be active when the desired RH or AH has been reached. The quantity of process air will decrease until the set minimum value. K. Cooling phase; this phase will become active when all boxes of the section, have reached the desired RH or AH and the minimum valve position (at J). The T° of the ingoing (channel) process air will accept the set value. The quantity of process air will be equal to the set % in the phase ´post-cooling´. L. Restart drying process. After the set time, the drying process will restart. The valve will open to the position that has been set for the post-drying. The T° of the ingoing air is equal to the `cooling phase´. The drying process stops when the desired RH or AH has been reached again. M. Setting max duration of relevant phase. After the set time the next phase becomes active, also when the desired RH or AH has not been reached. N. Remaining time of relevant phase. Setting `hatch position´ : The % at `hatch position´ represents the opened position of the valve `B´. This is related to the nominal air quantity as set per box (see page `fans/flow´). Cross-cut of a section. This opens by pushing on the desired section (1 till 6) in the general overview. 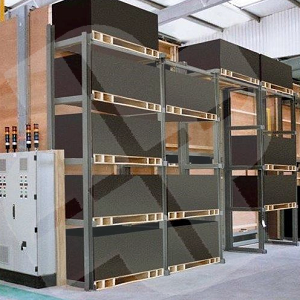 A. Drying boxes met status en measuring values; T°, RH and AH of the air from the boxes. C. Measuring value of the ingoing air; T°, RH and AH of the air from the section. D. Desired values of the ingoing air; Set T° and AH at the section. E. Water T° of the hot-water radiator. F. % Opened position of the three-way mixing hatch. J. % Opened position of the 3 hatch sections. K. Hatch section for inlet of inside air (recirculation). N. Release of section for start drying phase during placing of a box.